How can the city centre become a busy, but sustainable, heart of Birmingham : somewhere where people want to live, work and visit, and not just drive across? The new Big City Plan from the City Council looks like the right kind of vision for the future, so Friends of the Earth has welcomed it. In fact, we have urged them to go further, and the latest version does include more environmental measures than the draft plan: better walking routes and bicycle hire points, more public green spaces and some emphasis on energy efficiency of buildings. We are urging that they all be implemented and the approach should become mandatory. The plan offers a new park in Eastside, even allotment gardens. The buried River Rea can come back to the surface – watch out Stratford-on-Avon! Potentially, an expanded city centre can offer space for the new small businesses that will create sustainable jobs. The plan recognises the lack of independent shops and BFOE has stressed that we want space for them and for street markets, not more bland chain stores. Locally sourced products, including local food, should be on offer, and the Bull Ring markets supported. We say that the burgeoning creative sector should not be forced out by expensive new office developments. Shopping and working via the internet casts a lot of doubt on the need for big developments and tall buildings. We asked for an audit of how many office and retail buildings are already standing empty. The upward trend for people to live in central Birmingham would continue in the Plan. Although there is a surplus of single bed flats, family- sized homes would be added. We point out that these city centre residents should not all need to own and park cars. Car clubs should be designed in, for residents and workers to use, paying by the hour. Streets can become lively if freed from traffic, with pocket parks, little squares and seats – more like the civilised continental city. A survey of empty parking spaces is needed, to look at replacing them with more beneficial land usage. We see 20mph as the upper speed limit for traffic, but lower where shared space with pedestrians and cyclists is appropriate. On Sundays and public holidays we propose experiments with car free streets and car free days, as happens in other European cities. The level of cycling is abnormally low in Birmingham. However, when the Sky Ride closed some roads in September, 15,000 people rode into the city centre. Cycling is mentioned in the Plan as having ‘hubs’, where cycles can be hired. FOE points out that if cycling is to take off, as in London and Paris, then a network of cycle routes should be included in the plan, to prevent this form of transport being squeezed between traffic and pedestrians. New Street station is an obvious focus for such routes. The High Speed Rail station at Curzon Street and lines might result in new ‘severance’ in place of the old Inner Ring Road, if not designed carefully. Anyway, BFOE is far from convinced by the environmental or economic case for HSR – a continent-sized transport solution – for the rather short runs between cities in England. HSR might make us a suburb of London. Firms would not need to locate here, as workers could commute every day. They would then buy up the available accommodation, defeating the aim of a live-work city centre. Brummies would go to London for entertainment and shopping. Regional cities on the Continent benefit by a certain separation from their capital cities. Getting to Birmingham is not really a problem, but getting around it certainly is, as we have a major deficit on public transport; no underground, no on-street tram system. FOE is glad to see in the plan a reopening of passenger rail services through Moseley and Kings Heath, also through Fort Dunlop and Castle Bromwich. Moor Street can become even more of a local rail hub than it is currently. ‘Connectivity’ is a key aim of the Big Plan. The expanded city centre will be too large to be walkable, so a city centre public transport system is essential. The city has waited 30 years for a return of street trams. This would actually be a light railway, and building a short stretch down Corporation Street will be a very disruptive, complex and expensive project. Cities all over the world are planning ‘bus rapid transit’ – a much cheaper alternative, as BOE has frequently pointed out. Buses are much easier to fit on streets, without needing steel rails, hundreds of pylons and overhead wires. A ‘Vision for Movement’ accompanies the Big Plan including routes for ‘Birmingham Sprint’ – modern buses running on dedicated road space. They still draws Metro tram lines across the map, but Birmingham Sprint would seem much cheaper and quicker to implement. For short journeys door to door within the city centre we could make more use of shared taxis or on demand minibuses. 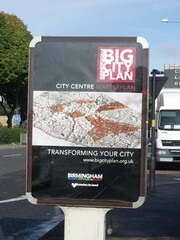 Overall, the Big City Plan is quite brave, considering Birmingham’s history of submission to the motor car. Friends of the Earth urges that future risks be taken even more seriously, particularly another major oil price hike and challenging targets on carbon emissions. The real Big Plan would be for a transition to a low energy, relocalised version of Birmingham which rediscovers its own resources and makes a sustainable future for itself. The consultation response on The Birmingham Big City Plan is being prepared between now and Christmas, and we would be very glad to hear from you with your ideas about this. Other plans will be following for suburban areas, such as the Moseley Big Plan allowing local people a say in their future shape.